Transmission Ultrasound technology is especially useful in visualizing detailed breast anatomy. 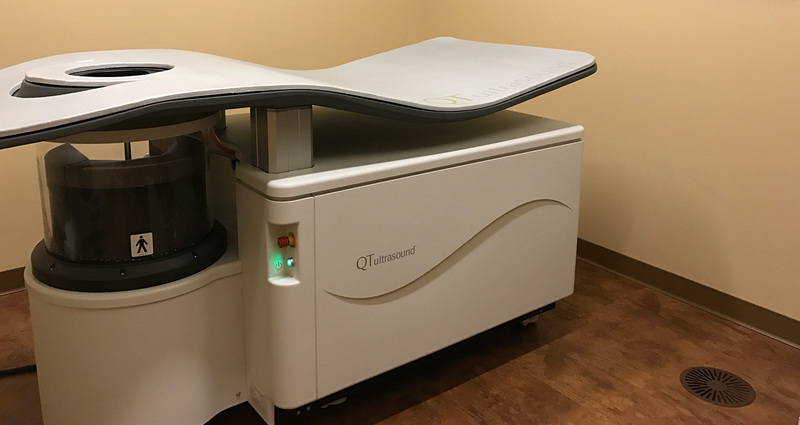 QT Ultrasound LLC has received 510(k) clearance from the U.S. Food and Drug Administration to market its Transmission Ultrasound breast scanner. The company’s Transmission Ultrasound technology generates high fidelity 360 degree images of the breast with excellent image clarity. The elimination of radiation and breast compression make the QT scan™ an important additional breast imaging tool for physicians and the women they treat; at this time it is not intended as a replacement for screening mammography. John Klock, M.D., founder and CEO of QT Ultrasound, explains that the company’s recent publications have shown that Transmission Ultrasound technology is especially useful in visualizing detailed breast anatomy. For more information about the clinical trials of the QT scanner, visit marinbreasthealth.com.